We’d love your help. 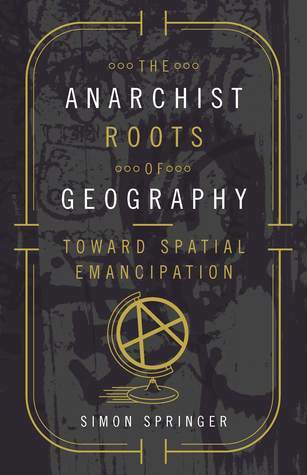 Let us know what’s wrong with this preview of The Anarchist Roots of Geography by Simon Springer. The Anarchist Roots of Geography sets the stage for a radical politics of possibility and freedom through a discussion of the insurrectionary geographies that suffuse our daily experiences. By embracing anarchist geographies as kaleidoscopic spatialities that allow for nonhierarchical connections between autonomous entities, Simon Springer configures a new political imagin The Anarchist Roots of Geography sets the stage for a radical politics of possibility and freedom through a discussion of the insurrectionary geographies that suffuse our daily experiences. By embracing anarchist geographies as kaleidoscopic spatialities that allow for nonhierarchical connections between autonomous entities, Simon Springer configures a new political imagination. To ask other readers questions about The Anarchist Roots of Geography, please sign up. Ce livre est intéressant, mais il manque de synthèse. Trop de redites. J’aurais également apprécié un plus grand apport de la géographie dans ce livre qui porte avant tout sur l’anarchisme. I thought the earlier essays were better than the ones in the second half. I'm not very into Springer's promotion of "post-structuralist anarchism," insofar as that's how one could define his project. He definitely does draw from the classical anarchist tradition as well, though, especially P. Kropotkin and Reclus. It seems that there are tensions between these tendencies in Springer's thought.